I always wanted to work on cars and went to College to study motor vehicles but needed work experience as part of my course. My tutor had a friend who worked for National Tyres, and when the branch offered me work experience it was a relief. 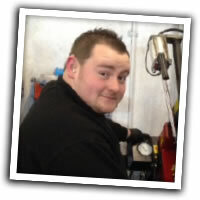 I worked every Saturday and eventually got the chance to work for National Tyres as an Apprentice Tyre Fitter. With the help of my manager, I passed all my exams, he gave me confidence and has shown me lots about cars and dealing with people. My team has always told me that my deafness will not stop me doing anything and one day I will be a manager in the future. I was surprised when I was told I had got Apprentice of the Year! I flew to Manchester for the first time to receive my awards. It was a fantastic time and worth it. Each day I do lots of different jobs in the workshop and my manager always shows me how to do all sorts of jobs. I fit tyres, steering, exhausts and my manager teaches me new things on every job that comes into the workshop and has always helped me try my best. Recently I have been learning how to use the computer, from booking in parts, creating customer bills and all the other paper work we use. I am really enjoying learning new skills and have always been helped to do my best. I really enjoy working for National Tyres because I learn a lot and I am willing to learn more to help me in the future. I really enjoy working in Newquay branch because everyone is really friendly to work with and they have all been willing to help me out. Working here has really helped me to move forward and focus on my future, and one day I hope to become a Branch Manager myself. They are more than just colleagues to me.